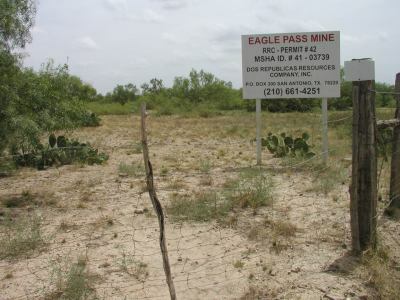 It is our objective to stop the proposed Dos Republicas Coal Partnership (DRCP) open pit coal mine in Maverick County, TX from operating due to the unacceptable risks it poses to the health and welfare of the citizens of Eagle Pass and Maverick County. 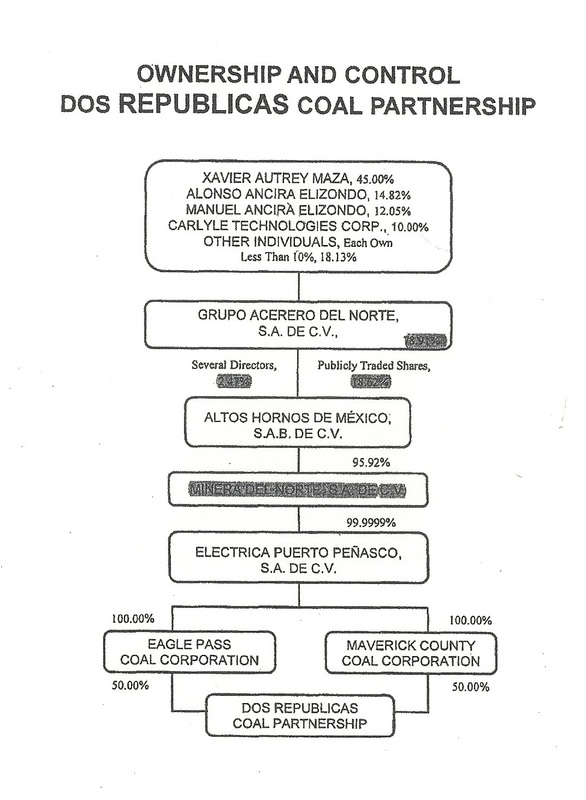 In January, 2013, despite opposition from Maverick County, the City of Eagle Pass, the Maverick County Hospital District, the Maverick County Environmental and Public Health Association, the Kickapoo Traditional Tribe of Texas and many individual landowners, DRCP obtained a permit from the Railroad Commission of Texas to operate an open pit coal mine 3 miles north of Eagle Pass (and very close to residential areas) ( see Diagram 1). State Senator Carlos Uresti and State Representative Poncho Nevarez also expressed their opposition to this mine. The vote at the Railroad Commission was 2 – 1, with Commissioner Porter opposing the permit. The mine permit area was later expanded from 2700 acres to 6346 acres (10 square miles). Although DRCP’s predecessor has had a permit to mine the 2700 acres since 1994, no mining had yet begun. DRCP began building infrastructure in December, 2013 and stated that they will start mining coal 12 – 18 months later. Mine layout is shown in Diagram 2. 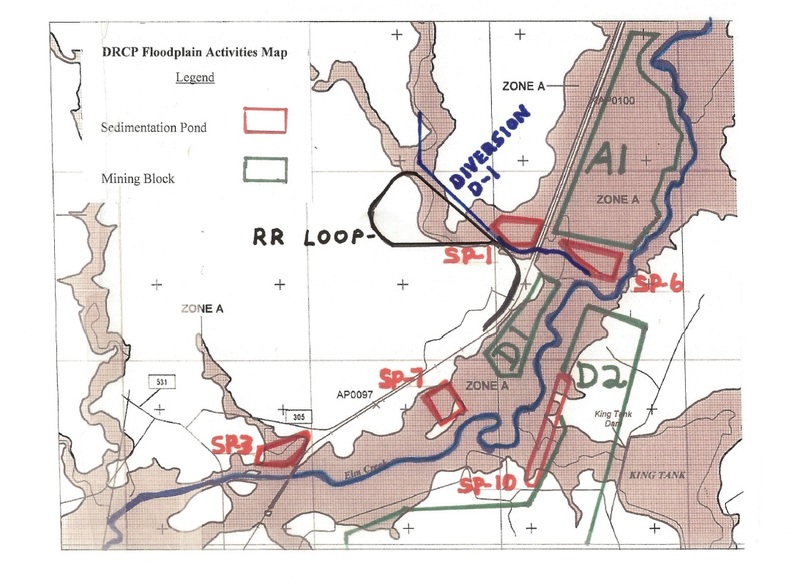 The DRCP application shows only 8 years of operation, but they have stated that there are 18 years of reserves on site. 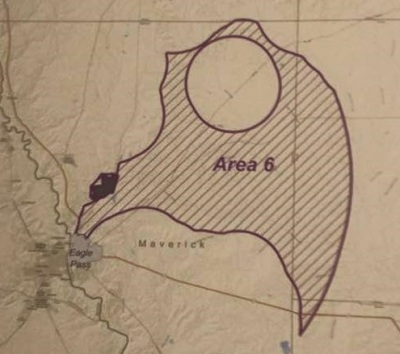 They will not say where they will mine for the next 10 years, possibly because they intend to mine much closer to Eagle Pass and other populated areas they already have leased ( Diagram 1). They plan to extract 2.8 million tons of coal per year; all will be shipped by railcar through the middle of Eagle Pass to Mexico (on one 100-150 car train per day) to be burned in the Carbon I and II power plants in Nava, Coahuila. 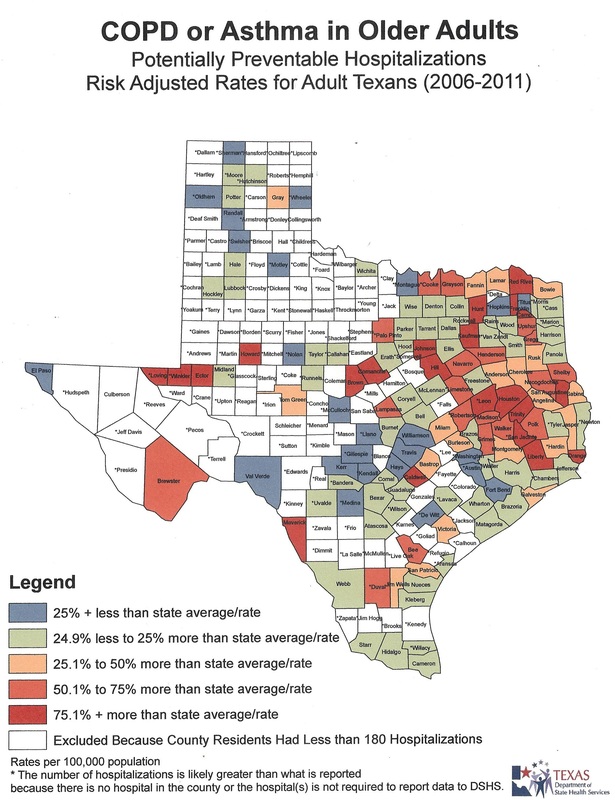 (Read about the infamous Carbon 1 and 2) Texas will receive no energy benefit from this coal. The coal at the proposed mine is of very low quality with an average 38% ash content (of which 50 – 70 % is silicon dioxide). Ash is the substances in the coal which will not burn. 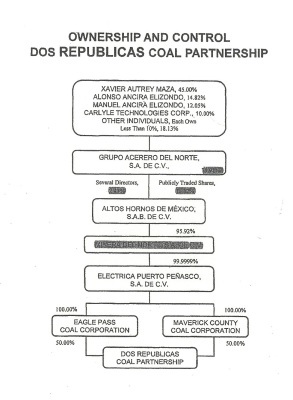 DRCP is a wholly owned subsidiary of Mexican mining companies such as Altos Hornos de Mexico (AHMSA) which control the larger coal mines in Coahuila ( See Diagram 3). DRCP has contracted with North American Coal Company and its subsidiary Camino Real Fuels to operate the mine. 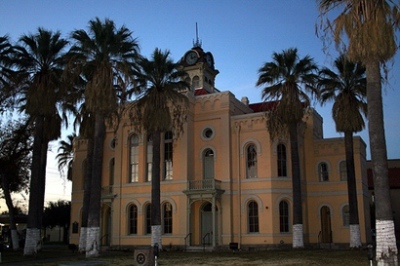 The decision by the Railroad Commission to grant DRCP a permit was appealed in State District Court in Austin by Maverick County, the City of Eagle Pass, Maverick County Hospital District, the Kickapoo Traditional Tribe of Texas, and the Maverick County Environmental & Public Health Association. 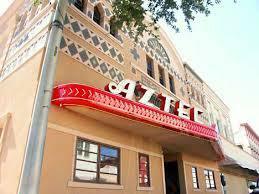 (The Kickapoo Traditional Tribe of Texas withdrew its opposition in May, 2012.) The court denied this appeal in March, 2014. The same parties listed above are currently appealing the District Court’s decision in the Third Court of Appeals in Austin. Oral arguments were heard on May 20, 2015 and a decision is pending. DRCP has already obtained a Texas Pollutant Discharge Elimination System (TPDES) permit from the Texas Commission on Environmental Quality (TCEQ). 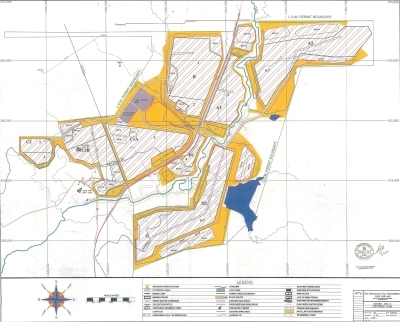 This permit was issued in a summary manner in November, 2011 without a contested hearing, based on DRCP’s application which stated that it was only renewing its permit for the original 2700 acre mine. 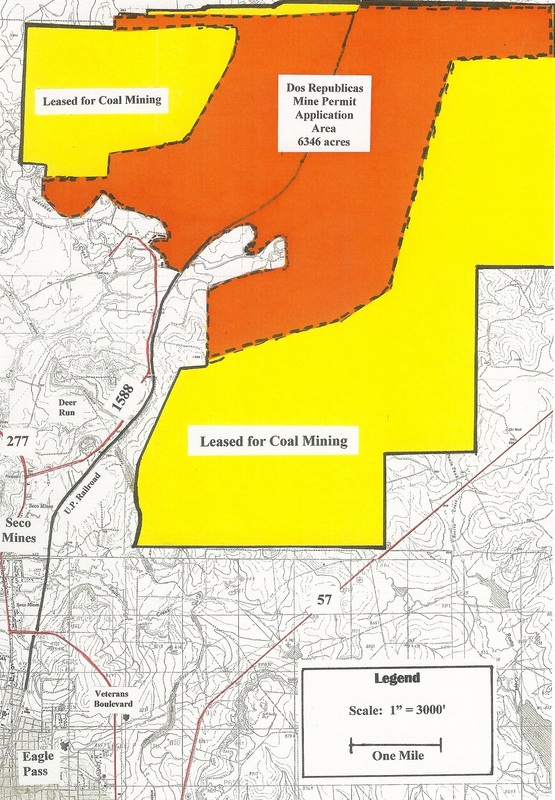 In September, 2013, DRCP filed an amendment application with TCEQ, seeking to revise its TPDES permit to cover the entire 6346 acre mine permit area. The State Office of Administrative Hearings (SOAH) will hold a hearing on the merits of this application beginning on November 16, 2015. 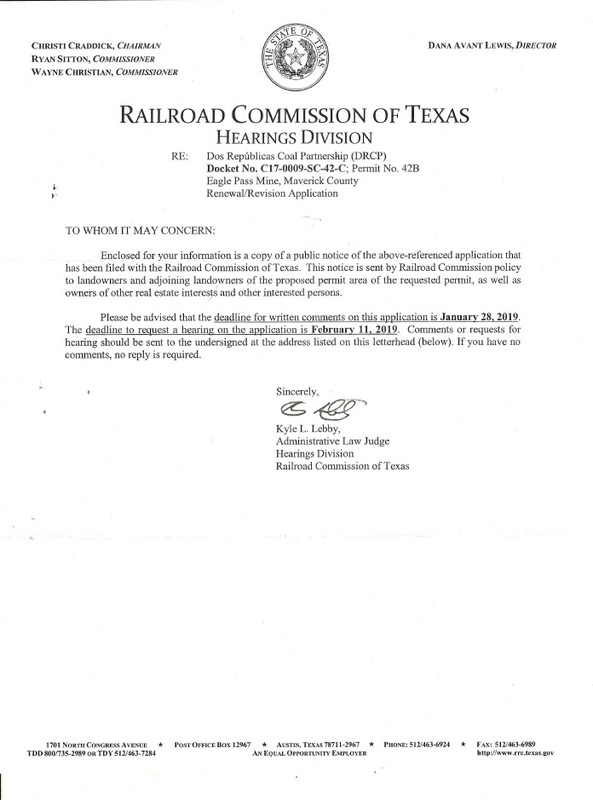 Senator Carlos Uresti and Representative Poncho Nevarez requested that the TCEQ hold a Public Hearing in Eagle Pass on this permit application and this was done on January 22, 2015. The overwhelming public sentiment at this hearing was against the mine and the granting of the permit. Texas law delegates Flood Damage Control to counties. 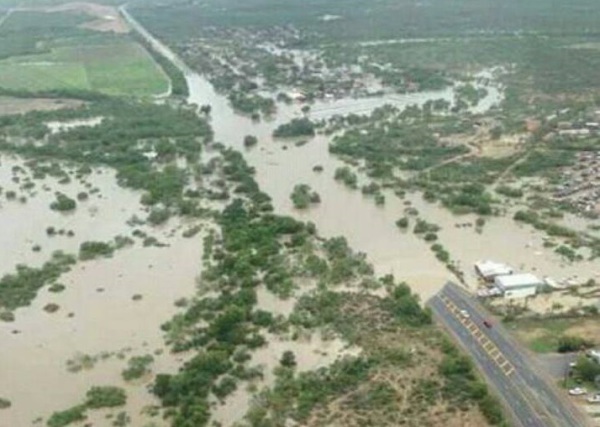 Because DRCP plans to mine coal and build infrastructure in a Federal Emergency Management Agency (FEMA) designated floodplain, it made an application to Maverick County to obtain a floodplain development permit. This application was denied in March, 2014. DRCP then sued the county in State District Court in Maverick County to try to force issuance of this permit. On October 9, 2014, the 293rd District Court denied DRCP’s request for a Writ of Mandamus to force the county to issue this permit. DRCP is now appealing this decision to the Thirteenth Court Of Appeals in Corpus Christi; no hearing date has been set. 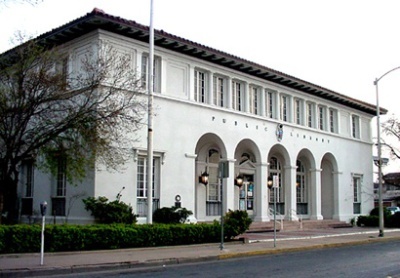 DRCP is also suing Maverick County for damages in regard to this permit in the 365th District Court; this suit has been placed on hold, awaiting the ruling by the Court of Appeals. DRCP has notified the U.S. Army Corps of Engineers that they wish to obtain a Regional Environmental Impact Statement which would allow them to expand their future mining operations in Maverick County from 6346 acres to 25,000 additional acres (40 square miles), an area six or seven times the size of Eagle Pass. This area has been designated as Study Area 6 and is shown in Attachment 4. 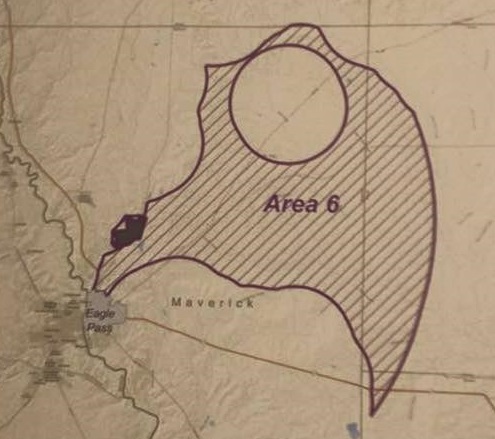 Area 6 includes the heavily populated suburbs of Seco Mines, Deer Run and Elm Creek subdivision and two elementary schools. As with any community dealing with mining air pollution is one of our top concerns for our citizens. During windy days (particularly in the winter when the wind is from the north) dust, coal dust and silica is liable to be blown from the mine site into Eagle Pass and its northern suburbs. DRCP will maintain huge stockpiles of coal (up to 250,000 tons) and overburden on site, and says it will rely on water and chemicals for dust control on the stockpiles, rail loading facility and haul roads. DRCP has said that the crystalline silica content of this coal is 4.57%. Crystalline silica is the cause of silicosis and many other diseases. DRCP DOES NOT have an assured source of water for dust control, a key part of their air pollution plan. According to the DRCP website they plan to control dust and air pollution by equipping trucks with spray nodules to contain the particles from getting into the air. 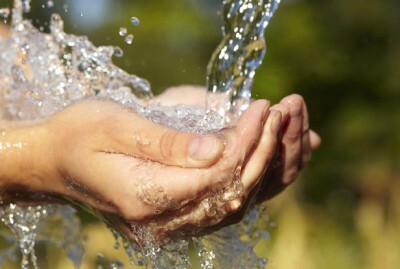 A 10 year contract with the Eagle Pass Waterworks System to supply water to the mine by pipeline lapsed in 2012. Some water is available from the Maverick County Water Control and Improvement District (the irrigation authority), but not enough to operate the mine. Their attempts to obtain more have been unsuccessful to date. DRCP has repeatedly refused to say what chemicals it plans to use for dust control. As a result, their effectiveness and environmental hazards cannot be evaluated. When coal cars are moved through Eagle Pass daily on the way to Mexico, coal dust could possibly be blown off the top layer through the town on windy days. This can affect the very young and very old. The railroad tracks pass very close to at least five elementary schools. Coal dust is a known cause of bronchitis and emphysema ; health studies in West Virginia have shown that people living in coal mining communities have a 70% increased risk of developing kidney disease and a 64% increased risk for developing COPD (chronic obstructive pulmonary disease) (Diagram 5). 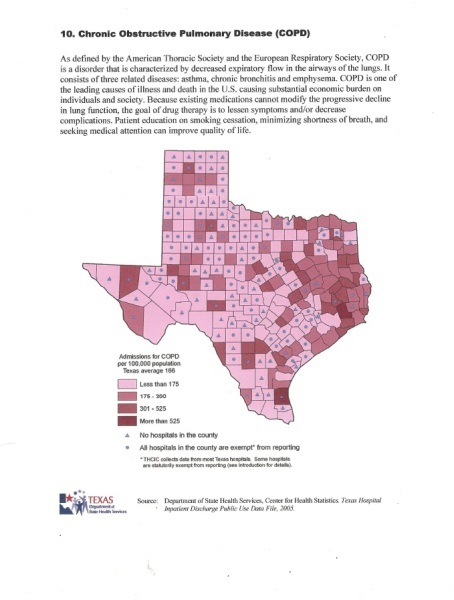 Maverick County already has a rate of COPD more than double the average in Texas (540 hospital admissions per 100,000 population versus 160). 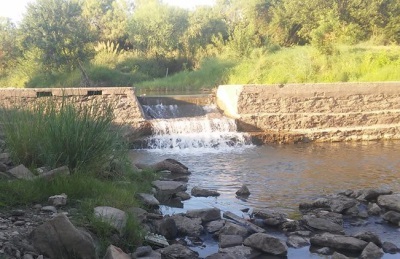 The Elm Creek flows through the mine permit area and drains directly into the Rio Grande two miles upriver from the City of Eagle Pass water intake. The Rio Grande River is the sole drinking water source for 50,000 people on the U.S. side and many more in Piedras Negras, Mexico. DRCP is supposed to build sedimentation ponds to protect the creek and contain mine wastewater from entering Elm Creek. These ponds are designed for a 10 year/24 hour rain event, which DRCP has calculated only 6 inches of rain to be sufficient. The life of the mine is planned to be at least 18 years, a greater rainfall event has already happened within its first month of mining operation. 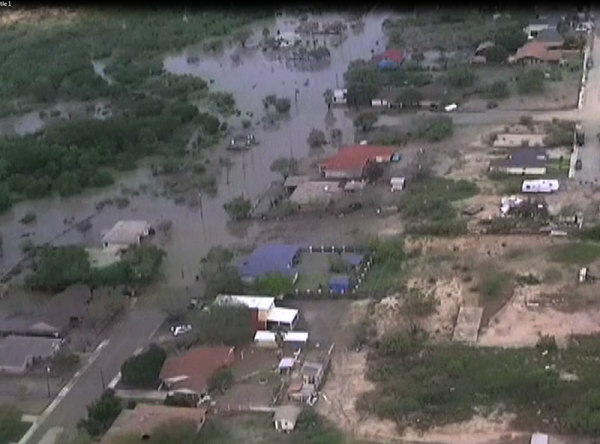 U.S. Government records show at least seven rain events of equal or greater magnitude in Eagle Pass in the past 20 years. These rain storms have caused Elm Creek to rise very rapidly. Three such events in June, 2013 (16 inches of rain in 24 hours) and June, 2014 (12 inches of rain in 24 hours) and October 9, 2015 (10 inches of rain in 24 hours) caused a rise of more than 13 feet over normal low water in Elm Creek. This could be sufficient to backfill and perhaps submerge several of DRCP’s planned sedimentation ponds, allowing the sediment to discharge directly into Elm Creek and then the Rio Grande. The three rainstorms cited above caused extensive flooding in Elm Creek and Seco Mines Subdivisions, which are located on the banks of that stream, downstream of the mine. As recently as October 2015 more than 300 homes were inundated with flood waters from the Elm Creek. As noted previously DRCP plans to mine coal and build several large sedimentation ponds in a FEMA designated floodplain. These are depicted in Attachment 7 . As the mine was in operation at the time of this last floods, investigations are ongoing as to if sediment from the ponds and the coal mining blocks were deposited into the creek and into flooded homes. A disaster of this sort would greatly increasing the damages inflicted on the homeowners and community. The coal, containing iron sulfide which, when it contacts air and water, forms sulfuric acid can result in acid mine drainage. 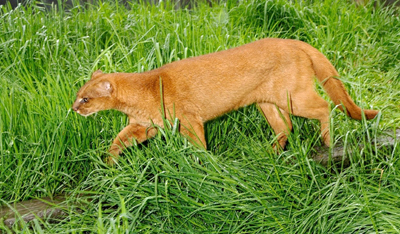 Two endangered species, the Ocelot and Jaguarundi, live within the proposed permit area. 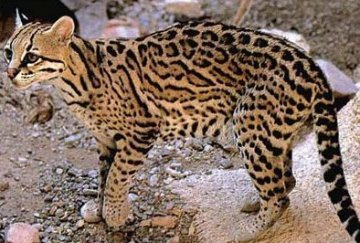 These cats have been sighted on several occasions in recent years and sworn affidavits to that effect have been taken from four individuals. The measures that DRCP says it will take to lessen the possibility of harm to these animals through vehicle mortality and light and noise harassment caused by 24/7 operation are inadequate. The threat to these species will only be exacerbated if the mine is expanded with an increase in animal deaths or their dispersal to other areas where they cannot maintain a breeding population. Our community may also be impacted by the usual adverse effects from blasting, noise and airblast. These blasts may be felt by the surrounding residential areas and the two nearby schools. We also should consider the factor of ground vibrations which can damage homes, particularly after repeated blasting over long periods of time. From knowledge of mine experts we know that vibrations can be amplified by the presence of old underground mine tunnels left over from the coal mining of 100 years ago. There are three such mines in the area between Eagle Pass city limits and the Dos Republicas mine, all with extensive workings under existing residences. In particular, the Lamar Mine shaft, which operated from 1907-1928, is located only 700 feet outside the DRCP permit boundary. Workings from this mine underlie at least five homes of local residents who are parties to the Railroad Commission proceedings. This has been demonstrated by numerous subsidences which have taken place on or near their property over the years, some as recently as 8 years ago. The U.S. Bureau of Mines has conducted studies which show that when surface mine blasting is conducted over or near abandoned underground mine workings, the negative effects are made much more intense than would be expected under normal circumstances: the amplitude of the shock wave is increased and the frequency of the vibration is lowered. Both of these conditions substantially increase the destructive potential of these vibrations on buildings. According to the EPA website, "Environmental Justice is the fair treatment and meaningful involvement of all people regardless of race, color, national origin, or income with respect to the development, implementation, and enforcement of environmental laws, regulations, and policies." Maverick County has a population which is 95% Hispanic. 34% of the residents live below the poverty line. 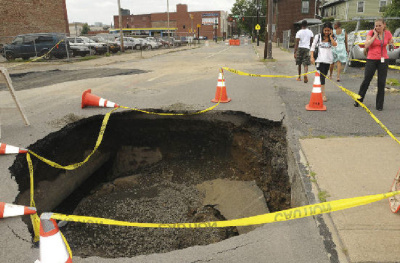 Both the City and, especially, the County governments are in a precarious financial condition. DRCP supported candidates have run (so far unsuccessfully) for county commissioner, mayor, city council and the hospital board to try to gain control of these entities and , no doubt, get them to cease opposition to the mine. All these factors combine to make DRCP’s attempt to impose an open pit coal mine on this community a prime example of environmental injustice. With the proposed expansion of the DRCP mine to the north, north-east and east of Eagle Pass, there is a very real possibility that this may physically restrain the growth and development of the city. Eagle Pass has grown significantly in the past 30 years in both size and population and will continue to do so, unless prevented by the mine. 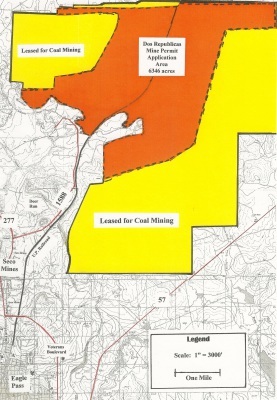 The proposed expanded mine area - 25,000 Acres. It will be 7 times the size of Eagle Pass if approved. As noted previously, DRCP is 100% owned by mining companies in Mexico. Many people believe that these companies have a very questionable business, safety and environmental record in their country. 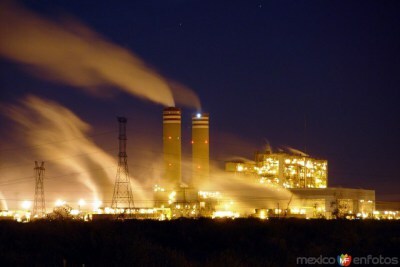 In an interview with the Piedras Negras Zocalo on November 7, 2012 the governor of Coahuila, Ruben Moreira, stated that coal mining in his state has “many disadvantages” and in “the matter of urban development it has destroyed the growth of Sabinas, Cloete and Agujita [3 towns in northern Coahuila].” As outlined in a Zocalo article on September 9. 2013, the city of Nueva Rosita, Coahuila as well is surrounded by abandoned mine workings that have literally encircled the town, preventing its expansion. Then on October 2, 2014, DRCP told the News Gram that the figure was now 130 – 180 jobs, while at the same time their spokesman was saying it was still 250. By way of comparison, the Belle Ayr open pit coal mine in Wyoming produces 10 times the amount of coal annually that the DRCP mine is projected to produce (28 million tons versus 2.8 million tons) and employs 280 people. It seems unlikely that a mine producing 10% of the coal that the Belle Ayr mine does would hire the same number of employees. Whatever the real number of jobs is (and so far the vast majority of them have gone to out-of-towners: the engineering company is from Houston, the construction company is from Austin and North American Coal is from Plano and they have all brought in their own employees from these areas), it is not worth the cost to the community in damaged health and the money it will take to treat those affected. This is the primary reason that the Hospital District is opposing the mine – they believe that the expenses they will incur treating indigent patients suffering from diseases caused by mine-related pollution will increase substantially.